Adopting Titan NVR’s advantages on megapixel recording, new Titan Pro Platform opens a new page for NUUO’s flagship Linux-based VMS solution. Designed for mid-scale system deployments, the Titan Pro provides customers with powerful recording capabilities and enhanced features to achieve system scalability, seamless integration but still maintaining a cost for performance advantage. NUUO Crystal™ Management Server maximizes management efficiency and transparency by allowing the configuring and viewing of an unlimited number of devices, users, and licenses under one unified interface: NuClient. NUUO’s leading technology, File Ring boosts recording throughput up to 250 Mbps for a single volume. This is also the NUUO Volume Group mechanism for managing volume load balance, which can further boost throughput and increase disk service life. The Metadata Plugin Pack makes integration fast and flexible. Third party devices such as Access Control and Point of Sale (POS) can be enabled by simply upgrading the plugin. No more wait for server function upgrade. • High throughput: supporting up to 64 channels of 5-Megapixel cameras, 250~550Mbps(TP - 8000R/ TP -8000RP). System Navigator: Use one NuClient to login multiple management servers. Watch videos from different recording servers under different management servers. Configuration on different management servers can also be accomplished. Linux Based: Stable, reliable and virus free. Camera Integration: Open platform support multiple camera brands, models and RTSP stream, UPnP search and Onvif ProfileS. Centrally configure camera parameters including video format, resolution, frame rate, and lens setting. Multiple and High Channel Streaming: Stream up to 256 connections per server to multiple clients simultaneously for live view. Support multiple stream profile from cameras, displaying lower bit rate but still record with good quality. Authorization Management: Manage function privilege and device access permission with unlimited roles, users and user groups. Third Party Integration: Integrate third party data and video on unified management platform. The plugin structure allows user extend the system by plugin installing. Schedule-Based Architecture: Unified Schedule Profile for event, users login duration, recording schedule, recording parameter and 3rd party streaming for complicate environment and requirement. Multiple Video Codec Support: NUUO Titan Pro supports H.264, MJPEG, MPEG4 and MxPEG for best quality and storage usage. Event/ Action Management: Centrally manages events from system, cameras, 3rd party metadata devices, and I/O devices with instant alert responses. Event and boost record reduce storage usage but ensure important period recording. Centralized System Status Overview: Real-time monitoring the status of all servers, cameras, IO devices, and metadata channels. Automatic NUUO Titan Search: Automaticly search for all Titans in the network. Automatic Camera Model Detection: Automatically search for IP cameras in the network (camera should support UPnP protocol) or manually insert it. Auto detection help users to find the brand and model of the camera after specifying its IP address. Dual Gigabit Ethernet Ports: NUUO Titan Pro is equipped with 2x gigabit ports. User can separate the recording stream from viewing stream to ensure the cleanest recording pipeline. License Management: Extend Recording Server to 64CH per server by license activation. Supports online/ offline activation and transfer. NTP Date/ Time Synchronization: The system can interface to Internet Time Server (NTP server) for time and date synchronization at each location. Titan Pro Server can play the role as NTP server on LAN environment. Watchdog: Support software watchdog and hardware watchdog (TP-8000R and TP-8000RP) to system stability. Diagnostic Service: A simple tool to retrieving important logs both from servers and clients for troubleshooting. High Recording Throughput (250Mbps for Single Volume Group): Process large amount of data throughput boost NUUO Titan Pro’s recording performance to 250 Mbps for single volume, about 64CH 5 - Megapixel cameras (H.264, 15 fps, moderate traffic). Volume group mechanism can further increase the throughput. Volume Group: Volume Group mechanism distributes camera throughput loading to multiple volume groups so that further enlarges recording throughput. Individual Recycle Condition (IRC) Per Device: NUUO Titan Pro supports individual recycle condition (IRC) for each video or metadata device. Videos within specified retention time periods will be protected from recycling deletion. Videos outside the retention time periods will be automatically deleted. When system reaches storage capacity limit, even video data within IRC retention periods will still be deleted to free up additional storage space for Recording. Users will be notified when this occurs. 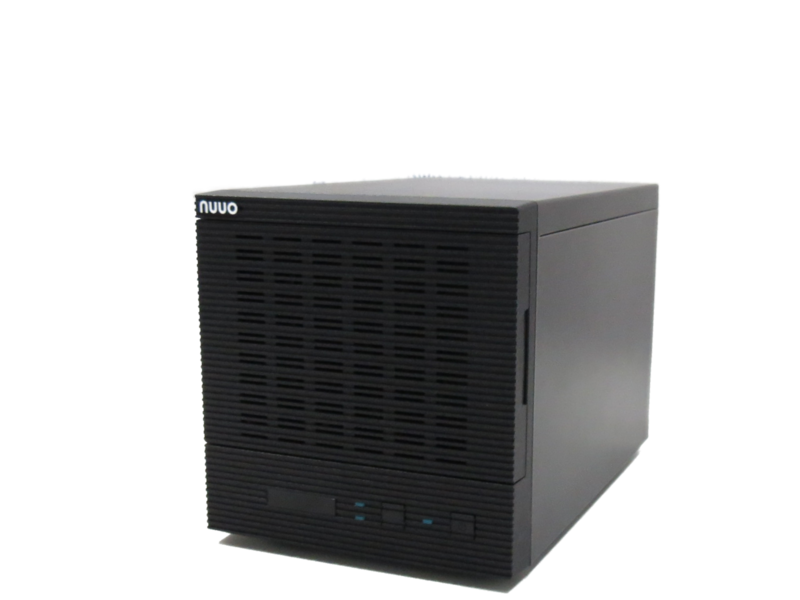 RAID: Support RAID 0,1,5 and 10 for maximum capacity or data protection at the HDD level. Multiple Recording Mode: NUUO Titan Pro supports multiple event-based and schedule-based recording modes. It also supports pre-event and post-event record to make sure seamless protection. External Storage: Support SAN (iSCSI) and DAS (eSATA). Edge Motion: Support camera edge motion detection, reduce server loading and ensure stability. 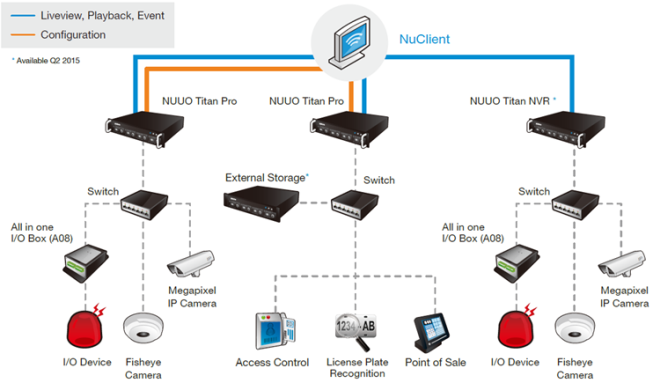 With event-action management and recording mode in NUUO Titan Pro, user can monitor system easily. Audio: Support camera audio and audio recording. Watermark: Protect original recording from alternation with our watermark verification tool. Unified NuClient: Support identical, full featured software client application and web client by browser. Cross Platform: NuClient supports both Windows and MAC OS. The web client supports both IE browser and Windows Firefox. View Management: Including View group, View tour, NUUO Titan Pro supports public view for all users and private view for each user. It also supports View Tour to loop through different selected Views. Multi-View: NUUO Titan Pro can duplicate the same live view video onto multiple channels and digitally zoom in to see the details of different spots on cloned channels without losing the original live view video. Joystick: Utilize joystick and keyboard to control cameras physical PTZ and software enabled digital PTZ function. Remote I/O Modules: Analog devices that are connected to NUUO I/O Modules are converted to Ethernet through a media converter which enables NUUO Crystal™ to starting recording when inputs are triggered, or trigger outputs when an event occurred. Redundant Power Supply: TP-8000RP supports internal redundant power supplies. This ensures seamless operation even when the primary power supply has failed. Failed power supplies can be replaced while system is still operating. APC UPS: NUUO Titan Pro supports external UPS (Uninterrupted Power Supply) power supplies which provide clean uninterruptable power. *Max recording throughput (250 Mbps): Approx. 64ch 5-Megapixel H.264 cameras at 10 fps when server is streaming out 16 channels of live video without playback. *Optimal recording throughput (150 Mbps): Approx. 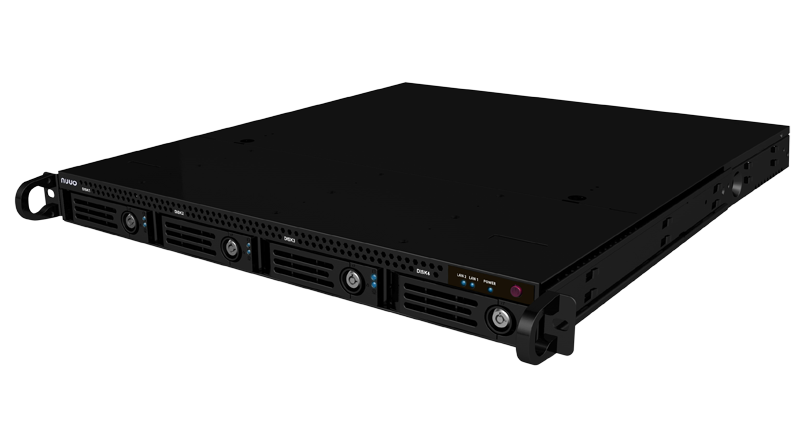 64ch 2-Megapixel H.264 cameras at 15 fps when server is streaming out 128 channels of live video and 16 channel playback.